Pen Question…wait for it…Answered! – Write with us! I’ve been thinking about bringing in the Graf von Faber-Castell pen line as an addition to the Design line of Faber-Castell. It’s an “outstanding product, celebrating 250 years this year, and handmade in Germany.” At least that’s what the representative said a week or so ago. But I have a lot of new pen lines to consider and just couldn’t make up my mind. So I had to think about it. I was secretly waiting until the Chicago Pen Show which runs this weekend, Thursday May 12th thru Sunday May 15th. Real pen enthusiasts take over the Westin O’Hare Hotel and major sponsors such as Krone and Stylus Magazine bring in the goods. The editor of Stylus, Nancy Olson is a good source of information. She’s kinda like an encyclopedia of pens you might say. So my goal was to corner Nancy at the show and get her opinion after her many tours and interviews with some of the major pen lines on the market. But before I could schedule her time during what is sure to be a busy weekend, a box arrived from Stylus Magazine. 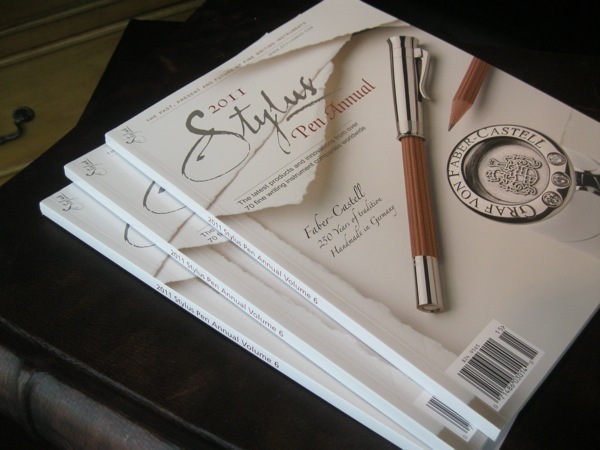 I can tell from the cover of the 2011 Stylus Pen Annual what Nancy thinks of Faber-Castell. Previous Post Dear Mom, Thank you! Next Post What is that golf lookin’ book?